Discussion in 'Internet & WWW' started by cute.bandar, Mar 25, 2019. When paying with paypal to some foreign merchant, choose the option to "pay in USD" and not the default option. Look for something like "View conversion option"
Ex: Paid 10$ for hosting via paypal. Paypal Calculated amount to Rs . 712 . I chose the pay in USD option. Paid 10$ , which in the bank records show as Rs. 690 . Paypal is evil. They don't use the actual currency exchange rate. They use their own inflated rate. When choosing the pay in USD/EUR option, the bank does the currency conversion at actual rates.. When paying with paypal to some foreign merchant, choose the option to "pay in USD" and not the default option. Can you post a screenshot of this "change currency for payment option"? I never noticed this option when paying via a paypal issued receipt. 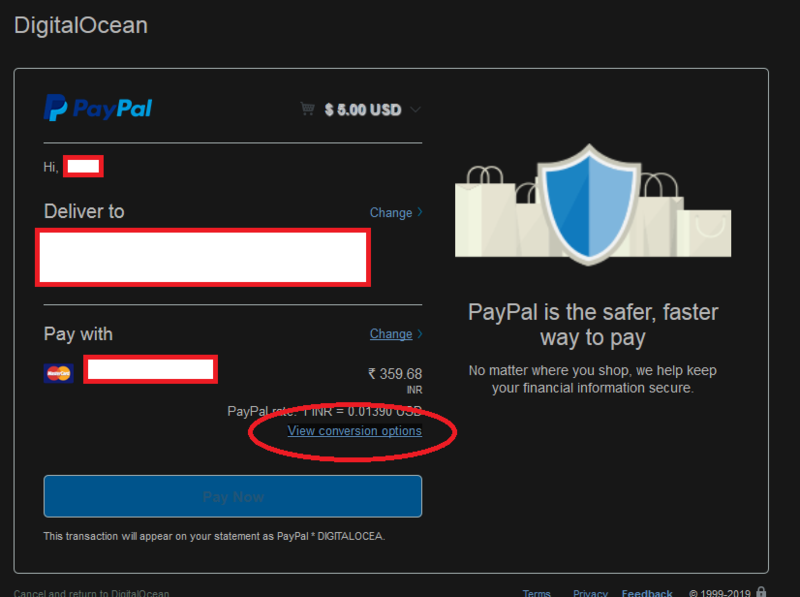 When paying with paypal on a site > login to paypal > "view conversion options"
Next, choose the USD option. I have noticed paypal moved the option position in the past. So that's what this "view conversion options" link is for,I always thought it was some kind of calculator tool.